LEAD JUDGMENT: MARY UKAEGO PETER-ODILI, J.S.C. This appeal borders on the Jurisdiction of the Federal High Court to try Banker-Customer relationship matters. This is an appeal against the judgment of the Court of Appeal, Lagos Division, Coram: Sidi Dauda Bage, JCA (as he then was), Samuel Chukwudumebi Oseji and Abimbola O. Obaseki – Adejumo JJCA delivered on the 30th day of March, 2016 where the Court affirmed the ruling of the trial Court delivered on 11th day of November, 2015 per M. B. Idris J. The Respondents’ grouse in presenting the suit in this appeal is that Appellant herein allegedly failed and/or neglected to adhere to an “in-principle” agreement reached between a certain Honeywell Group Limited (not a party in the suit of this appeal) and the appellant. 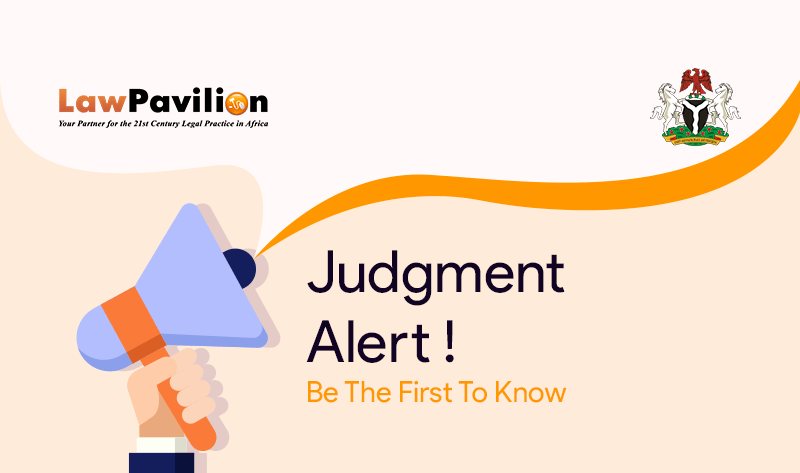 The respondents herein were indebted to the appellant bank over sums in excess of N5.5 Billion following which Honeywell Group Limited proposed to the appellant bank that the latter grant to it concessions on the total indebtedness. Appellant indeed, gave the concession as sought by Honeywell Group Limited that out of the entire N5.5 Billion outstanding, the negotiating Honeywell Group Limited pay a concessionary sum of N3.5 Billion on terms and conditions mutually agreed at the meeting of 22nd July, 2013. Further agreed at the 22nd July, 2013 meeting was that the negotiating third party, Honeywell Group Limited pay an immediate sum of N500,000,000.00 whilst the remainder N3 Billion is paid in bullet point form and before the departure of the then visiting CBN examiners at the appellants bank, in August, 2013. ​In a letter dated 22nd July, 2013 the negotiating third party, Honeywell Group Limited proposed fresh terms so as to stagger the repayment of the N3 Billion balance contrary to the agreement earlier reached. In confirmation of the above and upon receipt of the fresh proposal, appellant herein immediately caused to be issued; a letter dated same 22nd July, 2013 rejecting the new proposal and demanding a reversion to the agreement of 22nd July, 2013. There is no record of Honeywell Group Limited’s immediately and/or prompt reaction to the above reproduced assertions. Also by a letter dated 6th September, 2013, it was again admitted by the negotiating third party that agreement reached at the meeting of 22nd July, 2013 and for good order’s sake was for a bullet payment of N3.5 Billion. By a letter dated 14th September, 2014, the appellant’s bank again informed the negotiating third party that the agreement of 22nd July, 2013 became extinct and frustrated in August, 2013 following the palpable breach as contained and proposed in the letter dated 22nd July, 2013. However, that based on its unending proposal that the N3.5 Billion be deemed as full and final settlement of the obligations, appellant’s management submitted the fresh proposal to its board of directors and having considered same, the board rejected the offer. Following the foregoing, the respondents herein approached the trial Court seeking certain reliefs. At the resumed hearing before the trial Court on the 11th day of December, 2015 appellant’s counsel, informed the learned trial Judge, Idris J of the contempt apparent on the Motion on Notice dated 5th November, 2015. The appellant aggrieved approached the Court of Appeal. The appellant filed 2 (two) Notices of Appeal before the Court of Appeal one challenging the ruling of the trial Court dismissing appellant’s notice of preliminary objection dated and filed on the 11th day of December, 2015. The second Notice of Appeal, dated same 11th December, 2015 was against the trial Court’s ruling in respect of respondents’ Motion on Notice dated 5th November, 2015 which was contemptuous of the trial Court and which the trial Court discountenanced while adjourning hearing on the contempt proceedings commenced by the respondents against the appellant bank. At the hearing of the appeal, appellant herein withdrew the Notice of Appeal against the trial Court’s ruling over respondents’ contemptuous Motion on Notice. The Court of Appeal in its judgment affirmed the decision of the trial Court hence this appeal. (i) Whether the Lower Court was right to have affirmed the decision of the trial Court to assume jurisdiction on the claim before it arising out of a banker-customer relationship. (ii) Whether the Lower Court was correct in its resolution of the issue of cause of action, having considered the entire circumstances and facts of the case. (iii) Did the decision of either of the two Lower Courts breach appellant’s right to fair hearing. In the final analysis, the Court held that the appeal lacked merit and it was accordingly dismissed. Consequently, the decision of the Court of Appeal and High Court was affirmed.